Welcome to the third installment of the Cavaliers vs. Warriors trilogy. In 2015, the Warriors erased a 2-1 deficit to win the franchise’s first championship since 1975. Cleveland countered a year later by coming back from a 3-1 hole to take Game 7 on the Warriors’ home floor. It was the first title in Cavs history and the city’s first championship since the Cleveland Browns won the 1964 NFL Championship. Now the Cavaliers and Warriors meet in the NBA Finals for the third year in a row, a feat that even the Celtics vs. Lakers rivalry never accomplished. We played the NBA Finals 1,001 times using WhatIfSports.com’s NBA simulation engine, which aggregates the results to generate team and player averages. Golden State came out on top 74.0 percent of the time, equating to a 4-2 series win for the Warriors. According to the simulations, a five-game series in Golden State’s favor is a stronger possibility than the series lasting seven games. In simulations won by Golden State, the scores approached blowout status. The Warriors averaged 117.2 points per game and suppressed the Cavaliers to an average of 101.2 points. The Warriors shot nearly nine percent better from the field and more than six percent better from behind the arc. In simulations in which the Cavaliers won, Cleveland matched Golden State’s field goal percentage and outscored the Warriors by 10 points per game. 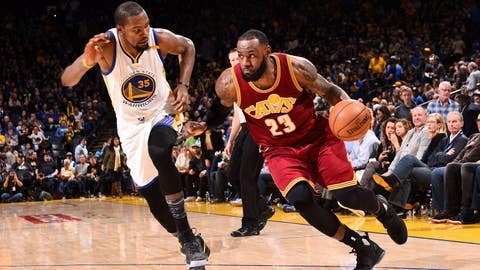 The Cavs connected on nearly 38 percent of three-point tries, compared to just 33.5 percent for Golden State. In addition to cashing in from behind the arc, Cleveland made nearly seven more free throws per game than Golden State.